truly, this cuteness is unbearable! Have you watched the Pandacam? When the mother picks up the baby in her huge paws and sits there cuddling it, I have to lie down to recover from the extreme cuteness! wish i could see the extreme cuddling cuteness. It is just all too cute for words and makes me squeeeee inside. I stole it! Mwahahahahahahaaaaaa. But I stole it from theodicy who said I could. You have written proof of it. Indeed! Spread the panda love, babies! We need some hope. They're just so snuggly! 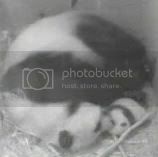 I've broken down and bookmarked the Pandacam. You're a pandacam enabler! Damn you! He's a good boy and I hope he has a long, happy, healthy life.